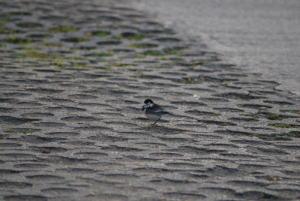 Observation - Pied Wagtail (Motacilla alba) - UK and Ireland. Description: One of about 15 all attempting to scavenge from a macdonalds that was dumped in the car park. I have not seen that before, I thought they only ate insects. One of about 15 all attempting to scavenge from a macdonalds that was dumped in the car park. I have not seen that before, I thought they only ate insects.